Antler chandeliers are commonly made from whitetail deer, mule deer, and/or elk. They can also be faux, which means they're reproductions. The antler chandeliers for sale below are mostly faux, but you can occasionally find a few real antler chandeliers. If the description says "cast" chandeliers, that's another way of saying they are reproductions, or faux. Please scroll down for good information to know before buying antler chandeliers. You might also like: Antler Lamps. 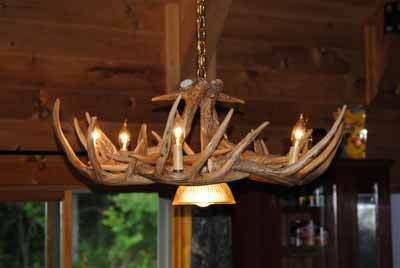 Below: An deer antler chandelier hanging from a wood beam ceiling. When buying antler chandeliers off of eBay or anywhere, there are some things to make sure you know before you make your purchase. Is the antler chandelier made from real antlers, or are they faux (reproductions, i.e. cast)? Do you care? 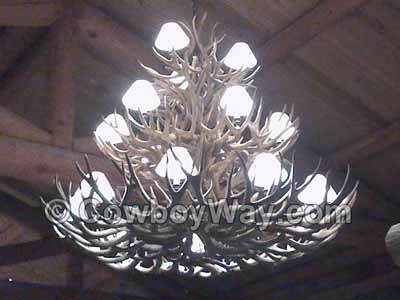 Many faux antler chandeliers look real and can cost a lot less. Are there enough clear photos of the chandelier that you feel you know exactly what you're getting? What is the weight and dimensions of the chandelier? Does it come with a chain, cord, etc. to hang it with? Will the seller ship to your location? Most antler chandeliers we've seen on eBay are shipped to anywhere in the USA and worldwide, but it's always smart to check. What the shipping charges will be? Is insurance for shipping the antler chandelier optional or automatically included? Is there a reserve? If so, you can email the seller and ask them to reveal the amount of the reserve price. Many sellers will cheerfully disclose their reserve price when asked, but not always. If you have any questions be sure to ask the seller before you bid on an antler chandelier. Look for the "Ask a question" link in the "Questions and answers about this item" area to ask your questions. Antlers are found on animals in the family Cervidae. Horns are found on animals in the family Bovidae (with the exception of the Pronghorn Antelope which is from the family Antilocapridae). Horns are made of two components: 1) a bone core, and 2) a sheath of keratin. Antlers are not a permanent part of the animals' skull. Antlers are grown, shed, and re-grown annually. Horns are a permanent part of the animals' skull and therefore are never shed. 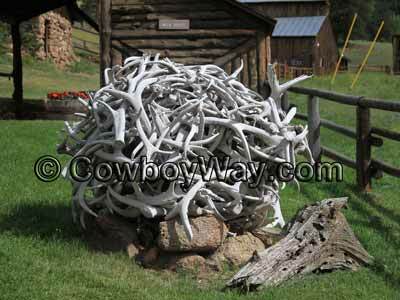 Below: Deer antlers on a cattle ranch in Colorado. These antlers are called "sheds" because they were shed from the deer during the annual shed-and-regrow cycle. In most species antlers are found only on males, but in caribou/reindeer are found on males and females. In many species horns are found on both males and females, but in some species are found only on males. Horns do not branch out. In other words, the tip of a horn ends in only one point on each side of the head. The bone of a horn is alive throughout the lifetime of the animal. Below: A very large antler chandelier at the National Cowboy and Western Heritage Museum, Oklahoma City, Oklahoma.